Antarctic Development Squadron Six (VXE-6 or ANTARCTIC DEVRON SIX, commonly referred to by its nickname, The Puckered Penguins) was a United States Navy Air Test and Evaluation Squadron based Naval Air Station Point Mugu, California with forward operating bases at Christchurch, New Zealand and McMurdo Station, Antarctica. Established at Naval Air Station Patuxent River, Maryland on 17 January 1955 as Air Development Squadron Six (VX-6), the squadron's mission was to conduct operations in support of Operation Deep Freeze, the operational component of the United States Antarctic Program. The squadron relocated to Naval Air Station Quonset Point, Rhode Island on 1 February 1956. On 1 January 1969 the squadron was redesignated Antarctic Development Squadron Six (VXE-6). Following the closure of NAS Quonset Point in the 1970s, the squadron relocated to NAS Point Mugu. Using the tail codes XD (1955) and JD (1957), the squadron flew numerous aircraft over the course of its existence—many of which were pioneering endeavors. For example, the first air link between Antarctica and New Zealand was established by men and aircraft of VX-6 in 1955. The following year, a ski-equipped R4D Dakota of VX-6 became the first aircraft to land at the South Pole. In 1961, the first emergency midwinter medical evacuation flight was conducted from Byrd Station to Christchurch. In 1963, an LC-130F Hercules of VX-6 made the longest flight in Antarctic history. In 1967, a United States Navy LC-130F of VX-6 completed the first scheduled winter flight to Antarctica, landing at Williams Field. 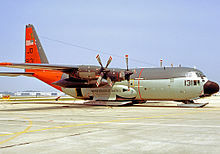 Following the closure of austral summer operations at Amundsen–Scott South Pole Station in February 1999, the squadron returned to Naval Air Station Point Mugu, California, where it was disestablished on 31 March 1999. VX-6 traces its roots to Operation Highjump (1946–1947), the fourth Antarctic expedition conducted by United States Navy Rear Admiral Richard Evelyn Byrd. That expedition set out in December 1946 to conduct an extensive aerial survey of Antarctica, using Martin PBM Mariners based in the pack ice of the Ross Sea, as well as land-based R4D Dakotas (Dakota, from the acronym "DACoTA" for Douglas Aircraft Company Transport Aircraft, was the designation used by the United States Navy to refer to the Douglas C-47 Skytrain). By the time Operation Highjump was concluded in late February 1947, the team had mapped about 5,500 miles (8,900 km) of coastline and 1,500,000 square miles (3,900,000 km2) of the interior of the continent. On 1 February, Task Force 43 was activated to plan Antarctic operations scheduled to begin in the fall under the code name Operation Deep Freeze, with Captain George J. Dufek as commanding officer. Dufek would remain as commanding officer through Operation Deep Freeze IV, which concluded in 1959. The mission of Task Force 43 was to provide all the logistical support necessary for the successful U.S. participation in the upcoming International Geophysical Year (1957–8). More specifically, this meant that Task Force 43 was responsible for the construction of airstrips and iceports and the establishment of bases on Antarctica that would enable scientists to conduct geophysical studies upon that continent. On 14 November, the flagship of the recently promoted RADM Dufek, Commander Task Force 43, steamed from Naval Station Norfolk, Virginia to rendezvous in New Zealand with other ships of the task force for the onward voyage to Antarctica. VX-6 made its first deployment at that time as part of Task Force 43 (the logistics arm of Operation Deep Freeze). That first season, VX-6 completed nine long-range exploratory flights. The squadron also transported people and materials necessary for the construction of Little America Base Camp, the Naval Air Operations Facility on Hut Point Peninsula (Ross Island), the first South Pole Station (now referred to as "Old Pole"), and assisted in the establishment of four other bases on the continent. On 20 December 1955, two Lockheed P2V-2 Neptunes and two R5D Skymasters (R5D was the designation used by the United States Navy to refer to the Douglas C-54 Skymaster) established the first air link between Antarctica and New Zealand with a flight from Christchurch to McMurdo Station. Following its return from Operation Deep Freeze I in February 1956, VX-6 was relocated to Naval Air Station Quonset Point, Rhode Island. Naval Construction Battalion Center Davisville, the site of manufacture of the first Quonset huts, was also located at Quonset Point. NCBC Davisville was the home of Naval Construction Battalion 200, which had been established to perform the construction of any facilities required by the United States Antarctic Program. In September of that year, LCDR Ray E. Hall drew the first rendition of "Puckered Pete", a cartoon character which later became the unofficial mascot of VX-6. The R4D-5L "Que Sera Sera" lands at South Pole on 31 October 1956. On 31 October 1956, during Operation Deep Freeze II, Qué Será Será, a ski-equipped R4D Dakota piloted by LCDR Conrad S. Shinn, became the first plane to land at the South Pole. The seven United States Navy men (RADM George J. Dufek, CAPT Douglas L. Cordiner, CAPT William M. Hawkes, LCDR Conrad S. Shinn, LT John R. Swadener, AD2 John P. Strider, and AT2 William A. Cumbie, Jr.) aboard that aircraft were the first to stand at this spot in 44 years, the last being Robert Falcon Scott's ill-fated Terra Nova Expedition in January 1912. RADM Dufek had chosen LCDR Shinn and his flight crew to attempt the landing, which was an extraordinary undertaking since the South Pole was almost 10,000 feet (3,000 m) above sea level where the aircraft engines would operate considerably below their optimum power levels. In addition it was expected that extremely cold conditions could be expected on the surface. The landing party remained at the South Pole for only 49 minutes, setting up navigational aids to assist the future delivery of materials and equipment for constructing a scientific observation station at the spot. Also in 1956, an R4D Dakota delivered the first group of 11 Seabees and 11 dog sleds, together with tents and other equipment to the South Pole, to begin construction of the first South Pole Station. In January 1958, a VX-6 UC-1 Otter made the first wheels-on-dirt landing in Antarctica at Marble Point. On 1 October 1959, RADM David M. Tyree (Commander, U.S. Naval Support Force Antarctica from 14 April 1959–26 November 1962) arrived at Naval Air Facility McMurdo Station from Christchurch aboard an R5D Skymaster piloted by LCDR J. A. Henning of VX-6. This first flight of the season marked the operational implementation of Operation Deep Freeze V.
On 9–10 April 1961, the first midwinter medical evacuation flight was conducted to rescue Leonid Kuperov, a seriously ill Soviet scientist, from Byrd Station. Two VX-6 C-130BL Hercules from Quonset Point flew from to Christchurch. One (piloted by CDR Lloyd E. Newcomer) then flew on to Byrd Station to pick up Kuperov, while the other stood by in Christchurch. The total distance flown during this rescue mission was just under 13000 miles. On 22 February 1963, an LC-130F Hercules of VX-6 made the longest flight in Antarctic history, covering territory never before seen by man. The plane (piloted by CDR William H. Everett and carrying RADM James R. Reedy (Commander, U.S. Naval Support Force Antarctica from November 1962–April 1965) among its passengers, made the 3,470-mile (5,580 km) flight from McMurdo Station, beyond the South Pole to the Shackleton Range and then southeastward to the pole of inaccessibility before returning to McMurdo Station; the duration of this journey was 10 hours and 40 minutes. Also in February 1963, VX-6 completed the first delivery of bulk fuel by a Lockheed LC-130 Hercules. The Lockheed C-121J Constellation of squadron VX-6 flies near Christchurch on 27 November 1965. This aircraft, named "Pegasus", crashed at Williams Field, McMurdo Station on 8 October 1970. Pegasus Field is named after this aircraft. On 26 June 1964, an LC-130F Hercules, commanded by LT Robert V. Mayer of VX-6, completed a round-trip flight from Christchurch to Antarctica in an emergency evacuation of petty officer B. L. McMullen, critically injured in a fall. As in the earlier medical evacuation of 1961, two planes, with teams of medical specialists on board, flew from NAS Quonset Point to Christchurch where one plane stood by while the other undertook the hazardous flight. On 30 September 1964, three LC-130 Hercules aircraft of VX-6 took off from Melbourne, Christchurch and Punta Arenas, respectively. The three aircraft flew to Antarctica, landing on Williams Field, 7 miles (11 km) from McMurdo Station. The flight from Melbourne, the first in history from Australia to Antarctica, passed over the South Pole to drop a 50-pound sack of mail to the wintering-over party, then landed at Byrd Station before proceeding to McMurdo Station. The arrival of RADM Reedy on this flight marked the official opening of Operation Deep Freeze 1965. Also in 1964, VX-6 conducted the first flight from Cape Town, South Africa to McMurdo Station, the first flight of a U.S. aircraft to the Soviet Vostok Station, and the first successful demonstration of trimetrogon aerial photography, used extensively to map Antarctica. On 7 June 1966, a C-130 Hercules, piloted by CDR Marion Morris of VX-6, returned to Christchurch after a flight to McMurdo Station to evacuate UT-2 Robert L. Mayfield, who had been critically injured in a fall. It was the third emergency air evacuation from Antarctica during the winter night. On 18 June 1967, The first scheduled winter flight to Antarctica was successfully completed when a United States Navy LC-130F of VX-6 flying from Christchurch landed at Williams Field. Although earlier winter flights had been made to Antarctica as a result of medical emergencies, this was the first planned flight. On 2 December 1967, an LC-117D Skytrooper landed at McMurdo Station from Hallett Station. This was the last C-117 flight on the Antarctic continent, marking the end of 11 years of service to VX-6 by the Douglas C-47 Skytrain airframe. On 1 January 1969, VX-6 was redesignated Antarctic Development Squadron Six (VXE-6). On 31 August 1969, two LC-130 Hercules aircraft of VXE-6 arrived at McMurdo Station, 6 weeks in advance of the opening of Operation Deep Freeze 70. Among the passengers were Rear Admiral David F. Welch, Commander U.S. Naval Support Force Antarctica (NSFA) and seven scientists. During Operation Deep Freeze 1978, VXE-6 evacuated five critically injured Soviets from the crash site of an IL-14 Crate transport aircraft at Molodyozhnaya Station on the southern shore of Alasheyev Bight in the Cosmonauts Sea. This trip was 1,825 miles round trip from McMurdo Station. On 28 November 1979, Air New Zealand Flight 901 (TE 901) crashed into Mount Erebus, killing all 257 on board. Three hours later, VXE-6 initiated the search and rescue effort (referred to as Operation Overdue), sending an LC-130R Hercules (XD-01, BuNo 160741, c/n 4731) and two UH-1N Huey helicopters from McMurdo Station to search the area of the last known position of TE 901 (approximately 38 miles true north of McMurdo Station). These aircraft were joined a half-hour later, at 4:16pm by six more aircraft launched from McMurdo Station. No survivors could be seen. At around 9:00 am, twenty hours after the crash, helicopters with search parties managed to land on the side of the mountain. The search parties confirmed that the wreckage was from Air New Zealand Flight 901, and that there were no survivors. In June 2009, Fifteen U.S. citizens were presented the New Zealand Special Service Medal(Erebus) for their work in the body recovery, victim identification and crash investigation phases of Operation Overdue, and resulting from the TE 901 crash. Those receiving the medal included LCDR Reedy Buford, CDR William Andre Coltrin, CDR Paul Richard Dykeman, LCDR William F. Ferrell, LCDR John K. Goodrum, PHAN Charles (Chuck) Hitchcock, PH2 Richard L. Horton, ENS George Mixon, CAPT Victor Louis Pesce, CWO Choyce Prewitt, and AD2 Brian Jon Vorderstrasse. LC-130R Hercules 159131 of VXE-6 crashed in Antarctica in 1987 while on a recovery mission. In 1988, another medical evacuation to the South African National Antarctic Expedition (SANAE) Station at Vesleskarvet nunatak broke the record for time and distance in a single Antarctic flight. Another highlight of the 1988 season was the recovery of an LC-130 Hercules that had been buried in ice and snow since its crash in 1971 near Dumont d'Urville Station. That aircraft was fully restored and operated with VXE-6 until its disestablishment in 1999. In 1990, VXE-6 moved almost 8,000 passengers and over 6 million pounds of cargo which included five resupply flights to Vostok Station. That year, VXE-6 also accomplished the first wheeled landing of an LC-130 Hercules on a blue ice surface near Beardmore Glacier. On 25 October 1991, the first all-female crew took an LC-130 Hercules to "open up" Amundsen-Scott South Pole Station. 1993 saw VXE-6 break many records, including the transportation of nearly 9.4 million pounds of cargo and fuel. On 3 February 1996, during the squadron's 40th annual deployment to Antarctica, the squadron conducted its last helicopter mission in Antarctica. The helicopter component of VXE-6 was formally disestablished in April 1996. 1997 marked the beginning of a three-year program designed to transition United States Department of Defense long-range logistic support for the Antarctic Program from the U.S. Navy to the U.S. Air Force, specifically the New York Air National Guard (NYANG). 1998 was marked by the delivery of materials necessary to begin the construction of the new South Pole Station, completed in 2005. Beginning in 1997, responsibility for long-range logistical support of Operation Deep Freeze was transferred from the VXE-6 squadron to the 109th Airlift Wing of the New York Air National Guard (NYANG). The transition was planned over a three-year period to avoid any negative impact on operations and to ensure a complete transfer of knowledge from the U.S. Navy unit to the NYANG. During the 1996/1997 season, VXE-6 operated six aircraft and was augmented by aircraft of the NYANG. VXE-6 operated five aircraft during the 1997/1998 season, and the number of flight hours was divided roughly equally between VXE-6 and the NYANG. The United States Air Force, via the 109th Airlift Wing of the Air National Guard, officially took over responsibility as the primary Department of Defense partner for the National Science Foundation in support of the U.S. Antarctic Program at the beginning of the 1998/1999 season. A new organization, Detachment 13, was formed to manage the overall support from the Department of Defense. The detachment replaced the NSFA organization. The main organizations under Detachment 13 were the 109th Airlift Wing of the NYANG, the Navy’s VXE-6 squadron, and Aviation Technical Services. For the 1998/1999 season, the six LC-130s of the NYANG were augmented by only three LC-130 aircraft of the VXE-6 squadron. Operation Deep Freeze 1999 was VXE-6's last deployment season in support of the United States Antarctic Program. On 24 February 1999, following the closure of Amundsen-Scott South Pole Station's summer operations, the last three LC-130R Hercules from VXE-6 returned to Naval Air Station Point Mugu, California. The squadron was disestablished on 1 April 1999. Over the course of its existence, VXE-6 logged more than 200,000 flight hours in direct support of United States interests (primarily scientific research) in the Antarctic. The squadron transported more than 195,000 passengers, delivered over 240 million pounds of dry cargo and nearly 10 million gallons of fuel to numerous sites throughout Antarctica. VX-6 crew members assemble a United States Navy UC-1 Otter aircraft at McMurdo Station. The XD tail code is clearly visible. This aircraft crashed on takeoff near Cape Bird, Ross Island, on 2 December 1955. A HO4S-3 is in the left background. On 18 October 1956, a P2V-2 Neptune crashed at McMurdo Station during a landing in whiteout conditions, killing David W. Carey, Rayburn A. Hudman, Marion O. Marze, and Charles S. Miller. On 12 July 1957, an HO4S-3 crashed in the vicinity of McMurdo Station during austral winter, killing Nelson R. Cole. On 4 January 1959, a UC-1 Otter crashed on takeoff at Marble Point, killing Harvey E. Gardner and Lawrence J. Farrell. On 9 November 1961, a P2V-7 crashed on takeoff from Wilkes Station, killing William D. Counts, Romuald P. Compton, William W. Chastain, James L. Gray and passenger geologist Dr. Edward C. Thiel. On 2 February 1966, a LC-47J crashed on Ross Ice Shelf during takeoff, killing Ronald Rosenthal, Harold M. Morris, William D. Fordell, Richard S. Simmons, Wayne M. Shattuck, and Charles C. Kelley. On 19 November 1969, a helicopter crash near Mount McLennan resulted in the deaths of two civilians—Jeremy Sykes, an NZARP film director and Thomas E. Berg, a USARP geologist. On 9 December 1987, an LC-130R (BuNo 159131, c/n 4522) crashed while landing at Site D-59 (Carrefour), 1,200 kilometers from McMurdo Station. LCDR Bruce Bailey and AK2 Donald M. Beatty were killed in this crash. Ironically, this mission was an attempt to recover the "City of Christchurch" aircraft that had crashed at the same site in February 1971. On 13 October 1992, a UH-1N Huey helicopter (BuNo 158249, c/n 31420) crashed in whiteout conditions near Cape Royds, resulting in the deaths of AMS1 Benjamin Micou and two civilians working for NZARP (Garth Varcoe and Terry Newport). In addition to the aforementioned fatality accidents, there were a number of less serious accidents. On 8 October 1970, a Lockheed C-121J Constellation (BuNo 131644, c/n 4145, named "Pegasus") departed Christchurch, bound for Williams Field. Aboard were 12 crew and 68 passengers on the first flight of the 1970-1971 season of Operation Deep Freeze. Weather conditions at Williams Field deteriorated during the flight to whiteout conditions, with a fierce snowstorm and zero visibility. After making six low passes over the field, the aircraft attempted to land with 90 degree crosswinds of up to 40 mph. On the second attempt to land, the starboard main undercarriage hit a snow bank and separated. The starboard wing broke off, and the airplane slid through the snow, causing damage to the tail. There were only slight injuries to five people on board. The aircraft hulk is still there. On 1 February 1971, an LC-130F (BuNo 148321, c/n 3567) crashed in Victoria Land when a JATO bottle broke loose during an open field takeoff. This caused the nose landing gear to collapse. Two weeks later, on 15 February 1971, another LC-130F (BuNo 148318, c/n 3562, named "City of Christchurch") taxied over a snow berm during a storm while maneuvering for take-off at McMurdo Station. The wing hit the ground, and the aircraft was burned beyond salvage. This was the first USN Hercules written off. On 28 January 1973, an LC-130R (BuNo 155917, c/n 4305) crash landed at Amundsen-Scott South Pole Station, after a late go-around in whiteout conditions. The original LC-130R crashed while landing at Amundsen-Scott South Pole Station in 1973. In the 1974/75 season during an open field takeoff on Dome C a JATO bottle on an LC-130F came loose and damaged the wing and one propeller thus causing an aborted takeoff. A fire in the wing caused further damage to the wing. An LC-130R was used in an attempt to rescue the scientists and aircrew. Reluctant to use JATO, the nose gear of the LC-130R collapsed in the rough ice and snow during the takeoff, forcing the rescue attempt to be aborted. A third LC-130 finally succeeded in rescuing all of the involved personnel. The National Science Foundation and the U.S. Navy made plans to recover the two downed aircraft during the next season. This involved replacement of the wing on the first aircraft and of the nose landing gear on the second aircraft. Preparations were made during the off-season to accomplish the repairs. After temperatures had risen sufficiently the recovery operations began in November 1975. Many flights were needed to transport all the material to the Dome C site. As an LC-130F took off for return to McMurdo another JATO bottle came loose, again damaging a propeller. Thus, Dome C became the home of three damaged LC-130s. As the damage to the last LC-130 was relatively minor compared to the others it was repaired first. Through the extraordinary effort of the repair team, maintenance team and aircrews, all three aircraft were repaired and recovered from Dome C.
On December 31, 1993, an LC-130 crashed on Lucy Glacier near Mount Isbell in the Geologists Range. The aircraft was retrieving a field party from the University of Wisconsin–Milwaukee who had spent six weeks investigating the geology in the mountains between the Byrd Glacier and Nimrod Glacier. The crash occurred in soft snow during an open-field takeoff when a propeller struck the snow, sending the propeller into the fuselage. Fuel from the damaged engine ignited, and the plane spun sideways sliding for approximately 200 meters down the glacier before coming to a stop. The plane was overhauled on site and flown back to McMurdo Station three weeks later. ^ "Ward Tower". Geographic Names Information System. United States Geological Survey. Retrieved 2011-05-19. ^ "Mount Coley". Geographic Names Information System. United States Geological Survey. Retrieved 2011-05-19. ^ "Mount Munson". Geographic Names Information System. United States Geological Survey. Retrieved 2011-05-19. ^ "Kelly Plateau". Geographic Names Information System. United States Geological Survey. Retrieved 2011-05-19. ^ "Gallup Glacier". Geographic Names Information System. United States Geological Survey. Retrieved 2011-05-19. ^ "Balish Glacier". Geographic Names Information System. United States Geological Survey. Retrieved 2011-05-19. ^ "Schneider Glacier". Geographic Names Information System. United States Geological Survey. Retrieved 2011-05-19. ^ "Ebbe Glacier". Geographic Names Information System. United States Geological Survey. Retrieved 2011-05-19. ^ "McCarthy Inlet". Geographic Names Information System. United States Geological Survey. Retrieved 2011-05-19. ^ "Allison Glacier (Antarctica)". Geographic Names Information System. United States Geological Survey. Retrieved 2011-05-19. ^ "Helms Bluff". Geographic Names Information System. United States Geological Survey. Retrieved 2011-05-19. ^ "Morton Glacier". Geographic Names Information System. United States Geological Survey. Retrieved 2011-05-19. ^ "Shockley Bluff". Geographic Names Information System. United States Geological Survey. Retrieved 2011-05-19. ^ "Eldridge Bluff". Geographic Names Information System. United States Geological Survey. Retrieved 2011-05-19. ^ "Van Reeth Glacier". Geographic Names Information System. United States Geological Survey. Retrieved 2011-05-14. ^ "Mount Nordhill". Geographic Names Information System. United States Geological Survey. Retrieved 2011-05-14. ^ "Dana Glacier". Geographic Names Information System. United States Geological Survey. Retrieved 2018-02-27. ^ "Peters Bastion". Geographic Names Information System. United States Geological Survey. Retrieved 2011-05-14. ^ "Mount Holt". Geographic Names Information System. United States Geological Survey. Retrieved 2011-05-14. ^ "Desko Mountains". Geographic Names Information System. United States Geological Survey. Retrieved 2011-05-14. ^ "Morgan Peak". Geographic Names Information System. United States Geological Survey. Retrieved 2011-05-14. ^ "Pesce Peninsula". Geographic Names Information System. United States Geological Survey. Retrieved 2011-05-14. ^ "Dykeman Point". Geographic Names Information System. United States Geological Survey. Retrieved 2011-05-14. ^ "Fisher Peak". Geographic Names Information System. United States Geological Survey. Retrieved 2011-05-14. ^ "Mazza Point". Geographic Names Information System. United States Geological Survey. Retrieved 2011-05-14. ^ "Old Antarctic Explorers Association Explorer's Gazette" (PDF). Pensacola, FL: Old Antarctic Explorers Association, Inc. 2011. ^ a b c d e Naval Historical Center (1997). "Naval Aviation Chronology 1954-1959: The New Navy" (PDF). Washington, DC: Naval Historical Center. Retrieved 2011-05-19. ^ a b c d e f g h i j k l m n o p q r s t Joe Hollern (1999). "History of Antarctic development Squadron Six". Webpage for United States Navy Squadron Antarctic Development Squadron Six. Retrieved 2011-05-19. ^ "History: Douglas C-47 Skytrain Military Transport." Archived 2012-12-14 at the Wayback Machine Boeing. Retrieved: 7 August 2008. ^ Wendy Leland (2003). "Naval Aviation 100 Years from Kitty Hawk" (PDF). Naval Aviation News. 86 (1): 10–19. ISSN 0028-1417. Retrieved 2011-05-19. ^ a b "Operation Deep Freeze" (PDF). Explorer's Gazette. 9 (2): 13. 2009. Archived from the original (PDF) on 2011-09-21. Retrieved 2011-05-19. ^ "Mount Hall". Geographic Names Information System. United States Geological Survey. Retrieved 2011-05-19. ^ Mike Subritzky (2008). "Operation Deep Freeze: The New Zealand Story". Matamata, New Zealand: New Zealand Antarctic Veterans Association. Retrieved 2011-05-19. ^ a b "Mount Shinn". Geographic Names Information System. United States Geological Survey. Retrieved 2011-05-19. ^ a b Maurice Cutler (1996). "First Plane Lands At South Pole" (PDF). The Antarctic Sun. 1996 (December 1): 1–2. Retrieved 2011-05-19. ^ a b Guy G. Guthridge (1997). "Antarctica Prepares for Science" (PDF). The Antarctic Sun. 1997 (November 29): 14. Retrieved 2011-05-19. ^ a b "Dufek Coast". Geographic Names Information System. United States Geological Survey. Retrieved 2011-05-19. ^ U.S. Centennial of Flight (2003). "Aviation History Facts". Aviation History Facts: October. Washington, D.C.: U.S. Centennial of Flight Commission. Archived from the original on 2012-10-04. Retrieved 2011-05-19. ^ Bill Spindler (2011). "Qué Será Será". Amundsen-Scott South Pole Station. Bill Spindler. Retrieved 2011-05-19. ^ "Cordiner Peaks". Geographic Names Information System. United States Geological Survey. Retrieved 2011-05-19. ^ "Mount Hawkes". Geographic Names Information System. United States Geological Survey. Retrieved 2011-05-19. ^ "Mount Swadener". Geographic Names Information System. United States Geological Survey. Retrieved 2011-05-19. ^ "Strider Rock". Geographic Names Information System. United States Geological Survey. Retrieved 2011-05-19. ^ "Cumbie Glacier". Geographic Names Information System. United States Geological Survey. Retrieved 2011-05-19. ^ "EXPLORATION: Compelling Continent". Time Magazine. LXVIII (27). December 31, 1956. ISSN 0040-781X. Retrieved 2011-05-19. Dufek was the first out of the plane, the second man since Norway's great Roald Amundsen (1911) and the first since Britain's doughty Robert Falcon Scott (1912) to feel Pole snow crunch underfoot. ^ a b George John Dufek (1957). Operation Deepfreeze. New York: Harcourt Brace. pp. 193–203. ISBN 1-112-16344-1. Retrieved 2011-05-19. ^ Patrick Swadener. ""Que Sera Sera": The South Pole Landing". Savequeserasera.org. Retrieved 2011-05-19. ^ James E. Waldron. "A Walk in the Sun". Retrieved 2011-05-19. ^ "Mount Tyree". Geographic Names Information System. United States Geological Survey. Retrieved 2011-05-19. ^ "Newcomer Glacier". Geographic Names Information System. United States Geological Survey. Retrieved 2011-05-19. ^ "Everett Range". Geographic Names Information System. United States Geological Survey. Retrieved 2011-05-19. ^ "Reedy Glacier". Geographic Names Information System. United States Geological Survey. Retrieved 2011-05-19. ^ a b c d e f Naval Historical Center (1997). "Naval Aviation Chronology 1960-1969: The Sixth Decade". Washington, DC: Naval Historical Center. Retrieved 2011-05-19. ^ "Mayer Crags". Geographic Names Information System. United States Geological Survey. Retrieved 2011-05-19. ^ "Morris Glacier". Geographic Names Information System. United States Geological Survey. Retrieved 2011-05-19. ^ Francillon, René J. McDonnell Douglas Aircraft Since 1920, pp. 466–7. London: Putnam & Company Ltd., 1979. ISBN 0-370-00050-1. ^ Transport Accident Investigation Commission (1980). "AIRCRAFT ACCIDENT REPORT No. 79-139: Air New Zealand McDonnell-Douglas DC10-30 ZK-NZP, Ross Island, Antarctica, 28 November 1979" (PDF). Wellington, New Zealand: Office of Air Accidents Investigation, Ministry of Transport. Archived from the original (PDF) on 24 January 2013. Retrieved 14 May 2011. ^ Peter Thomas Mahon (1981). "Report of the Royal Commission to Inquire into the Crash on Mount Erebus, Antarctica of a DC10 Aircraft Operated by Air New Zealand Limited" (PDF). Wellington, New Zealand: P.D. Hasselberg, Government Printer. Retrieved 2011-05-14. ^ New Zealand Air Line Pilots' Association (2009). "The Search for TE901". Auckland, New Zealand: New Zealand Air Line Pilots' Association. Retrieved 2011-05-14. ^ Archives New Zealand. "U.S. Navy SITREP from 28 November 1979 (Page 2)". Retrieved 2011-05-14. ^ Archives New Zealand. "U.S. Navy SITREP from 28 November 1979 (Page 4)". Retrieved 2011-05-14. ^ Bill Spindler. "Air New Zealand DC-10 crash into Mt. Erebus". Retrieved 2011-05-14. ^ "Erebus Medals". The Antarctic Sun. Retrieved 2011-05-14. ^ a b c d e f Ada Johnston (1999). "Historic Campaign Ends; VXE-6 Departs the Antarctic" (PDF). The Antarctic Sun. 1999 (February 7): 10–11. Retrieved 2011-05-16. ^ John Pike (2005). "Antarctic Development Squadron (VXE) 6 "Ice Pirates"". Alexandria, Virginia: GlobalSecurity.org. Retrieved 2011-05-17. ^ a b William T. Baker & Mark L. Evans (2000). "The year in review 1999:Part 1" (PDF). Naval Aviation News. 82 (5): 18–22. ISSN 0028-1417. Retrieved 2011-05-17. ^ a b Simon Stephenson (1998). "A Season of Science" (PDF). The Antarctic Sun. 1997 (November 8): 2. Retrieved 2011-05-16. ^ Jaqueline Kiel (1997). "Navy News..." (PDF). The Antarctic Sun. 1997 (October 18): 7. Retrieved 2011-05-16. ^ William T. Baker & Mark L. Evans (2000). "The year in review 1999:Part 2" (PDF). Naval Aviation News. 82 (5): 30–9. ISSN 0028-1417. Retrieved 2011-05-17. ^ a b c d Billy Ace Baker. "Operation Deep Freeze fatalities". Retrieved 2011-05-12. ^ "Carey Glacier". Geographic Names Information System. United States Geological Survey. Retrieved 2011-05-19. ^ "Hudman Glacier". Geographic Names Information System. United States Geological Survey. Retrieved 2011-05-19. ^ "Marze Peak". Geographic Names Information System. United States Geological Survey. Retrieved 2011-05-19. ^ "Miller Peak". Geographic Names Information System. United States Geological Survey. Retrieved 2011-05-19. ^ "Mount Cole". Geographic Names Information System. United States Geological Survey. Retrieved 2011-05-19. ^ "Mount Gardner". Geographic Names Information System. United States Geological Survey. Retrieved 2011-05-19. ^ "Mount Farrell". Geographic Names Information System. United States Geological Survey. Retrieved 2011-05-19. ^ "Counts Icefall". Geographic Names Information System. United States Geological Survey. Retrieved 2011-05-19. ^ "Compton Valley". Geographic Names Information System. United States Geological Survey. Retrieved 2011-05-19. ^ "Chastain Peak". Geographic Names Information System. United States Geological Survey. Retrieved 2011-05-19. ^ "Gray Spur". Geographic Names Information System. United States Geological Survey. Retrieved 2011-05-19. ^ "Mount Rosenthal". Geographic Names Information System. United States Geological Survey. Retrieved 2011-05-19. ^ "Morris Cliff". Geographic Names Information System. United States Geological Survey. Retrieved 2011-05-19. ^ "Mount Fordell". Geographic Names Information System. United States Geological Survey. Retrieved 2011-05-19. ^ "Mount Simmons". Geographic Names Information System. United States Geological Survey. Retrieved 2011-05-19. ^ "Mount Shattuck". Geographic Names Information System. United States Geological Survey. Retrieved 2011-05-19. ^ "Kelley Peak". Geographic Names Information System. United States Geological Survey. Retrieved 2011-05-19. ^ "CASA Final Report DF-61, Chaplain's MWR Input". Antarctic Journal of the United States. 1 (2). 1966. ISSN 0003-5335. Noel Gillespie (2006). Courage, Sacrifice, Devotion: The history of the U.S. Navy Antarctic VXE-6 squadron, 1955-99 (2nd ed.). West Conshohocken, Pennsylvania: Infinity Publishing. ISBN 978-0-7414-2912-4. This page was last edited on 21 November 2018, at 23:02 (UTC).